Ritchies IGA re-opened their refurbished and enlarged IGA store at New Lambton NSW this week with a huge variety of unique and local regional brands. One of the featured brands is The lolly shop’s snack food lines. Pictured is the stand for The Lolly Shop near the checkout counters. The Ritchies store offers the pack of 6 Rocky road Cupcakes which includes 3 flavors (Milk Chocolate, White Chocolate and Dark Chocolate. 2 of each) so there is something for all kinds of Chocolate lovers in that pack. See also the Macadamia Brittle and the Peanut Brittle. Two old fashioned caramel toffee lollies just like your granny used to make. One of our best selling snack foods is the Honeycomb (plain or choc coated in a 130g bag). The Lolly Shop is a registered business name and a subsidiary of Opera Foods Pty Ltd. 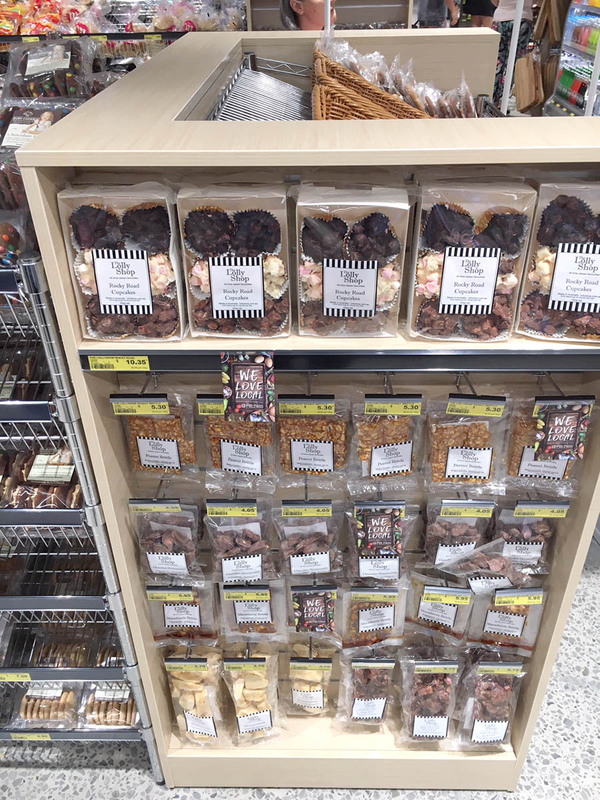 The post Buy The Lolly Shop Snack Food at Ritchies IGA appeared first on The Lolly Shop.